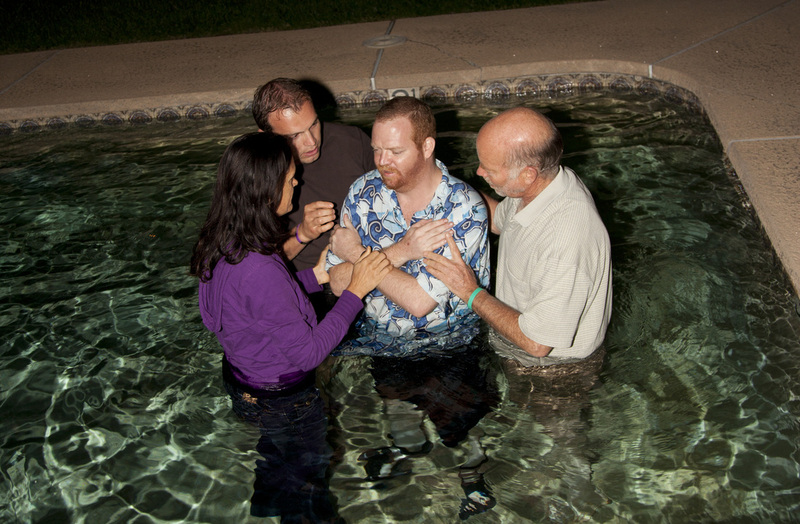 Neighbor's baptism in Boulder Creek swimming pool, 2011. Left to right: Karina Paine, Liviu Zoe, MIles Hart and Barrow Mills. For a long time now I (Karina) have had a heart for outreach and neighborhood transformation. As a second year BSSM student I started up a gathering in my apartment where we worshipped, had a bible study and invited neighbors along. As part of my Bethel internship and later volunteering in the Outreach Dept (2010 - 2013) I was part of an oversight team where we trained BSSM students to pastor some of the more "rougher" neighborhoods in Redding. I have also been involved in planting and overseeing Neighborhood bible studies/worship nights where both the "unchurched" neighbors and Bethel members/students have got together. Seeing a need to go deeper in relationship in discipling people where they lived I independently started out renting apartments from landlords, furnishing them and subletting mostly to BSSM students that had a heart to reach out to their neighbors. I am now focusing my time (with support from my husband Matt) on this independent initiative of owning/subletting out these apartments and independent ministry. Please note, I am not a Property Manager. Some of these neighborhoods are in lower socio-economic areas where addictions (drug and alchohol) are common place. As such, there are very real needs (emotional and physical) where Jesus can bring hope and that is why we are intentionally living there! This may not be for everyone, especially for those that would feel vulnerable, uncomfortable or unsafe in this environment. Our desire is for students (and for some, their parents) to make a well informed decision that is best for their level of comfort in participating in a ministry like this. If you (or your parents) would like to discuss this further, please get in touch! to independently partner with Bethel’s mandate to see personal, regional and global revival. Bill Johnson’s vision is to see Redding become a model of a transformed city for the world to see. He is 100% convinced and expectant that this is going to occur. to play a part in seeing entire neighborhoods throughout Redding transformed by God’s love and power with the people in them saved, healed and delivered especially in lower socio economic, higher crime areas. To pastor a city, not a church. to see these transformed neighborhoods be a tipping point as a testimony for the world to see, and be an inspiration for others to do the same in their own communities around the globe.